One of my earliest memories, from when I was 3 or 4, is of the Marimekko sheets on my parents' bed. The pattern was made up of small flowers spaced sparingly around a white background- a thick green ink stroke for the stem, and blobs of red, blue or yellow for the bloom (I recently came across a vintage tin with the same pattern on etsy). The mattress was about eye level, and I remember staring at the flowers and wondering if my younger, finger paint obsessed brother had put them there. Later on, I started shopping at Finnish import stores in Northern Ontario, where there is a large Finn community, and you could find all kinds of Marimekko prints and products than weren't readily available in the cities we lived in. 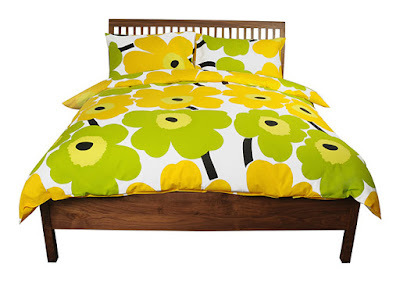 Today, our apartment is full of Marimekko, from pillows to tea towels. It's a wonder my boyfriend doesn't go crazy from all the colour. Clearly, however, I'm not alone. This year is Marimekko's 60th anniversary. A beautiful new flagship store just opened in NYC, along with several other stores worldwide. The big, bright retro prints are still my favourite, but the more recent clean and minimal designs are also addictive. Lumimarja is my print of 2011. More at the Guardian and Marimekko blog. Posted by la femme at 7:53 p.m.